The night scenery along the Rue Sous le Fort in the Quartier Petite Champlain in Old Quebec, Canada is very romantic and peaceful as the buildings glow from the lights. As night settles in around the historic Rue Sous le Fort in the Quartier Petite Champlain in Old Quebec City, Canada, the lights around the shops come to life. During the evening hours, Rue Sous Le Fort becomes a romantic area where people enjoy fabulous meals at quaint restaurants amongst the soft lighting. Other people like to stroll along the street at night enjoying the scenery while browsing in the windows of the shops where fashion, art, jewelery and unique gifts are displayed. Made up of cobbled stone, the Rue Sous le Fort in the Quartier Petite Champlain is always kept extremely clean and the exterior of the shops are adorned with flourishing plants and soft lights at night. 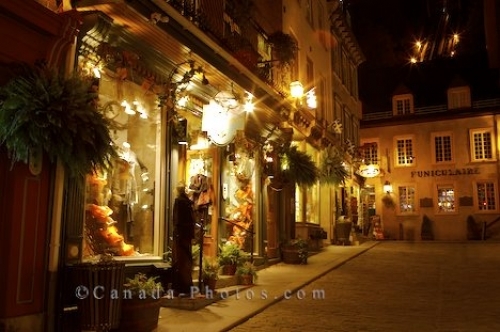 Photo of the tranquil scenery along the Rue Sous Le Fort in Quartier Petite Champlain in Old Quebec, Canada at night. ... UNESCO World Heritage Site.